The doors were pained by Mary "May" Gertrude Balch (1875-1961) in 1935. They hung in her home at 28 Boston Rd. One door features a rustic woodland scene, and the other features a deer woodland scene. The building was demolished in 2004. Rustic woodland is now installed as the museum’s storage room door, while the doorknob came from the deer door in storage. 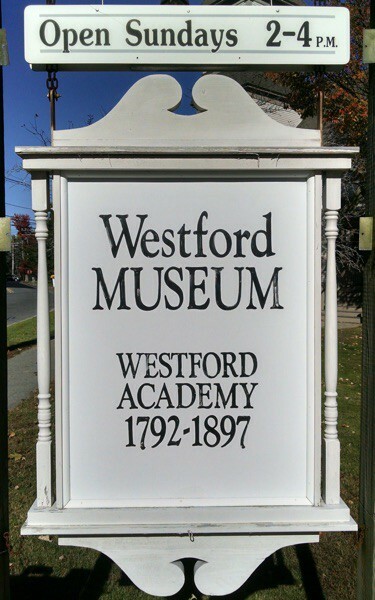 May entered Westford Academy 1888, and graduated from the Massachusetts Normal Art School in 1896. Doors were not her only medium as an artist. She did paintings, greeting cards, designed clothing once featured in the museum’s gift shop, and was the Supervisor of Drawing at South Hadley Falls, MA, school system. The museum has her painting of the original WA building as well. She was memorialized as one of the Westford Women dolls exhibited in the museum. The doors were donated by Westford resident Carol Avery.